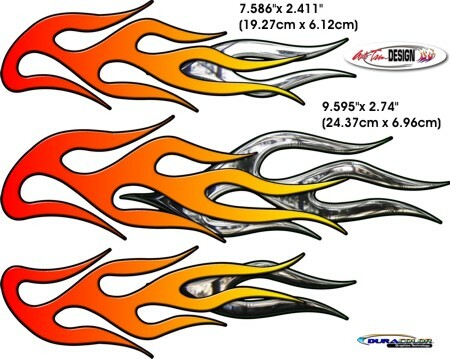 Dress up your bike with these "Hot" Orange to Yellow & Simulated Chrome flame decal sets. The kit comes with three (3) precut flame pieces (one  for each side & one  center) in the colors shown. The DuraCOLOR manufacturing process for this item features Orange to Yellow faded & Simulated Chrome components as shown. Moreover, the graphics are covered with a 2 mil clear laminate which will protect the graphics from miles of abuse.